Right smack within the hustle and bustle of the Theater District of NYC (across from The Lion King on Broadway, very close to Times Square) was the venue for the CANJAM NYC 2017; the 6th Floor of the New York Marriott Marquis Hotel. Living in Manhattan, it was breeze for me to get there, which I did on Sunday from 10:00AM, via the 7th Avenue Subway line right to the 42nd Street /Times Square stop. I was checked in at the front desk by the always helpful Marjorie Baumert (Director of the wonderful RMAF) who quickly gave me an efficient and quick overview of the floor plan. In a nutshell: There was a huge and spacious main room, the Broadway Ballroom, where a large number of exhibitors were lined up at their tables in several rows. In the middle of the room was a delightful and (yes) quiet lounge area with white tables, where one could take a rest, or meet and chat with someone. Outside of ballroom were two more separate areas on opposite sides. Each had a handful of separate rooms, including one very quiet one (Winter Garden Room) for the press which even had refreshments for us (I am told they even offered pizza on Saturday). Most of the other rooms were shared by 1-3 exhibitors, but a couple of the rooms hosted but one company. I found these separate rooms a pleasure to explore and do some listening and chatting with the vendors due to the more intimate/quiet presentation. Quick work at the registration desk. Marjorie Baumert (head of Rocky Mountain Audio Fest) and her co-workers. The Broadway Ballroom was large enough to hold all the exhibitors and a big crowd of enthusiasts. In the first side room I visited (Uris Room) I came across Unique Melody (UM), maker of fine custom in-ear monitor headphones. A company that started in 2009, they are first to incorporate a 'hybrid design' with their original Merlin model. I was well taken care of by very friendly and knowledgeable Lawrence Lee. I tried out several different models. My definite favorite was their flagship MaestroV2, which uses 12 drivers, starts at $1699 and uses a relatively high-end cord which is made of 8-braided pure silver and pure copper. I listened to Miles Davis' Kind of Blue and was deeply impressed by the clarity, smoothness and bass. The second pair I heard were their very newest planar drive ME1 model which retail for $700. They looked fascinating as well as sounding great. Yours truly listening with the MaestroV2. In a neighboring room (Plymouth Room) I met up with always kind and gracious Jack Wu of Woo Audio. I was lucky to thus have a leisurely listen to Woo Audio's exceptional WA8 Eclipse all-tube headphone amp/DAC (battery operated), which uses 2-3 vacuum tubes (I used the one with 3 running). At about 2.5 lbs, and 6.7"(L)x 3.6"(W)x1.7"(D), it is not meant to be a tiny lightweight gadget that fits in your pocket, but rather has the quality of a much heavier/larger unit but still is small -- and does not have to be plugged into an outlet. Woo was using TidalHiFi streamed to a tablet which was cabled to the WA8 via USB. Having TidalHiFi at home, I was easily able to choose what I wanted; I chose the album Gaucho by Steely Dan. I was very impressed with the sweet, deep and luxurious sound. Headphones used were by Focal, both the `Utopia' open back ($4,000) (wow) [Audiophilia review forthcoming - Ed] and the `Elear' open back ($1,000). I was amazed at the power of the WA8, I never had to push the volume level (out of 10) past 3!. The WA8 comes in Black or Space Gray ($1799) and then (the one I used) a gorgeous Gold ($1899). As Curly from Three Stooges used to say whenever he came across a woman he was deeply attracted to, `Woo Woo Woo!" In the other area of separate rooms, I spotted a sign outside the door for Smyth Research (Palace Room) all by themselves. I carelessly assumed they were `Soundsmith', makers of outstanding turntable cartridges. I had a reason: my 3-year old daughter had very recently destroyed my turntable cartridge, and I was in need of a new one, so I rushed in. No. This was something not only totally different, but truly fascinating. Smyth Research was showcasing their Realizer - A16 ($1,950), a `Personalized 3D Audio for Headphones' device. It claims/attempted to precisely emulate (virtually) up to 16 speakers in a sound room over stereo headphones, with audio codecs such as Dolby Atmos. So, they had their own numerous reference speakers all over the room for calibration for your personal use when listening-while sitting in a chair to show of all this. Sadly, I was not able to listen myself since this really wasa 1 person at a time endeavor -- and I had limited time. But I took some photos; I must re-visit them at a more opportune time. The guys running the place were very friendly and accommodating to all who came in. Smyth Research was showcasing their Realizer - A16 (USD $1,950). I now decided to enter back into the Broadway Ballroom, where many exhibitors were on hand. Admittedly, it was overwhelming and with so many amazing exhibitors, and limited time on my hands, I had to limit myself to mainly taking photos, and checking out more carefully only a handful of specific ones. This was truly an exceptional space as I hinted at before. I primed myself in advance with a strong mug of coffee from the press room. I first came across the table by Linear Tube Audio/Well Pleasec AV, with the always cheerful, fun and engaging Mark Sossa (Well Pleased AV) who has a fine taste for Italian audio equipment, using (for example) the exceptional DACS by Aqua. A pair can even be used to run very efficient speakers. Mark Sossa on left (Well Pleased AV), Will Schneider-White (Linear Tube Audio). At the front of the Ballroom was Periodic Audio, and man they have a very cool presentation. They make (only) ear buds and name them after metal elements in the chemical periodic table --based on the metals used in the buds. At this point they offer three models (lowest to highest): Mg (Magnesium) at $99, Ti (Titanium) at $199, and the Be (Beryllium) at $299. The display is scientific/hospital-like, with the very friendly and knowledgeable displayers wearing lab coats. They were using a CI Audio dual component DAC/AMP (about $1000 total). I tried all three models and was particularly impressed with their honesty about if and when you need to move to a higher level. Very reasonable prices and increasing quality (I really like those BE); review of all three forthcoming soon. While walking down one isle, I spotted Michael Jurewicz, President of Brooklyn based Mytek, known for their various 'can do all' DACS/headphone amps such as the Brooklyn and the higher end Manhattan II models. I have listened to those superb models before; but Jurewicz showed me his new baby, `Clef', a tiny high-resolution headphone Bluetooth amp (that also excepts wired input via USB). Weighing only 3 ounces (85 gms) and only 3.5"x2.5"x0.5" in size, not only can it handle 32/384 PCM and DSD128 at a 120dB dynamic range, but it also has a built-in decoder for MQA. It can handle wired headphones of high quality given its power (2.2 VRMS output, 10 Ohm impedance, single ended). It is battery and USB powered, and when Bluetoothing it with your mobile phone, it allows for making/receiving phone calls while listening to music. One can just toss this Clef in your pocket, and bluetooth from an iPhone while walking/talking. At $299, the Clef is expected to ship in May 2017; this looks like a winner. The Japanese CompanyFinal Audio Design displaying their exquisite jewelry-like buds; so beautiful that I was afraid to touch anything! ZMF Headphones was attracting a lot of attention with their ZMF Atticus ($999) and flagship Eikon ($1299) models that come in a beautiful hand-varnished Cherry wood, and lambskin headband padding. For $100 more they come in African Padauk wood. I peeked in the room of Audio Precision when Chris Gill was giving a headphone test using their APx515 and even higher end APx555 analyzers that can cost up to $32,000. You plug your cans into it and it performs all sorts of testing of frequency responses and such. Each area of testing is given a `Pass' or a `Fail', all shown on a projected screen. He was demonstrating how a lesser set of cans might pass an initial (easy) test, but miserably fail the others. The analyzers can be used on a wide range of devices (headphones are only one small example), and rental of their units is possible (instead of buying). By mid afternoon, it was time for me to depart. This event left me in high spirits. 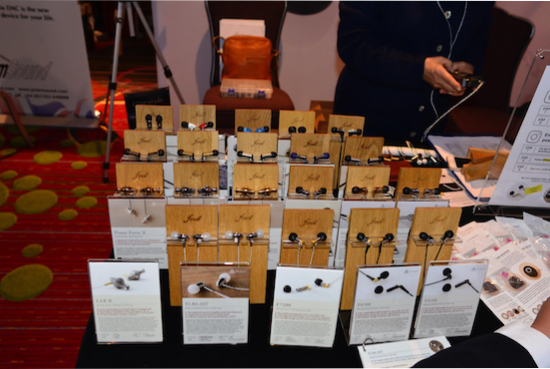 Back In November 2016, The NY Audio show had returned to Manhattan after several years of drifting away; and it is already planned to remain so for the future (Park Lane Hotel on Central Park South). Now, in Midtown is the CANJAM NYC. Large and well organized in a great space. Together these shows are transforming NYC into (as it should be!) a center for high-end audio and personal audio products. Bravo.